Even though this piece is in the key of D minor, it’s happy and energetic with clever, unexpected harmonic twists. L.H. 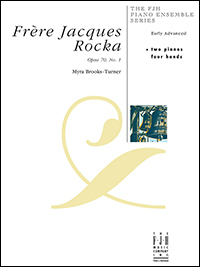 utilizes solid and broken 5ths throughout; R.H. has jazz-style grace notes; and both hands play a contrary-motion chromatic scale. This two piano, four-hand duet takes the well-known French folk songs Alouette and Sur le Pont D'avignon and gives them a classic boogie-woogie, eight-to-the-bar treatment that will definitely bring the house down! This piece is a perfect closer or encore for performances. 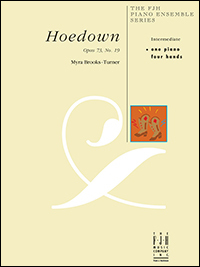 A spirited intermediate level piece for one piano, four hands that will make your students feel like square dancing! This bouncy, country-style piece gives both the primo and secondo a turn playing the melody and accompaniment. Great entertainment for recitals! 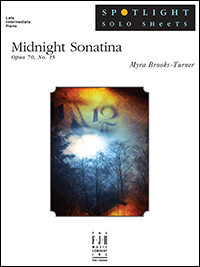 The intermediate level pianist can experience a fresh alternative to conventional works with this three-movement sonatina. 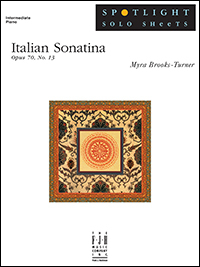 Marked by contrasting movements—spirited, lyrical, and allegro—teachers will appreciate the consistency of the sonatina form with a new thematic structure. This perky piece brings to mind a “south of the border” celebration with all the pageantry and excitement of a mariachi band. It starts in C major, modulates to F major, and ends in C major. Uses parallel 6ths in the right hand, and arpeggiated 10ths in the left. Easy to learn and fun to play! You may come up with your own favorite colors as you explore the timbres in this beautiful solo. A lyrical melody in F major is supported by arpeggiated chords in Section A and blocked chords in Section B. This piece calls for artistic use of pedal and reading inner ledger lines. This lyrical Chopin-style waltz is one that students will enjoy learning and performing. 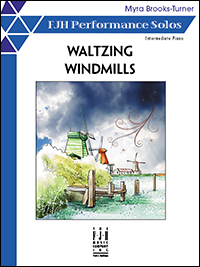 Beneficial in the study of musical and technical characteristics of the waltz style, students can apply techniques learned from this piece to many other pieces they will encounter in the standard repertoire. 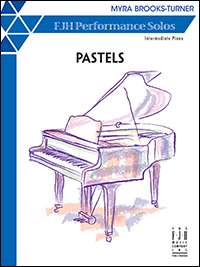 This work is perfect for recitals as well as personal enjoyment. 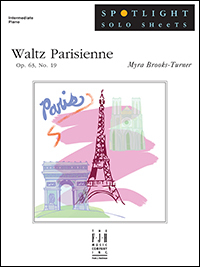 Waltz Parisienne is a lyrical intermediate level solo written in 3/4 time and in G major. 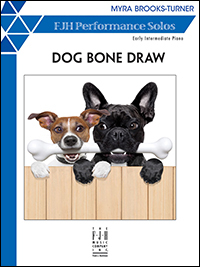 The lyrical melodic lines and fluid rhythmic motion throughout will showcase your students’ expressive playing. Selected for the NFMC 2014-2016 bulletin, this piece opens with bold octaves in both hands then moves to a lyrical melody. In the key of D minor, the technical demands are L.H. arpeggios, chord inversions, and octaves. 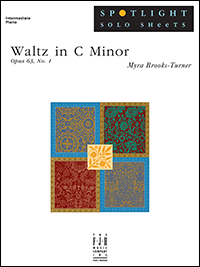 This appealing three-movement work by Myra Brooks-Turner features dazzling scale passages in the first movement, dramatic and expressive left hand leaps in the second, and a light and fanciful third movement in 6/8 time. 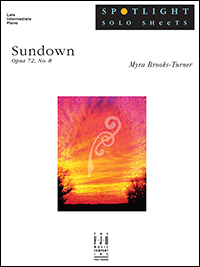 Sundown, a gentle and reflective piece for the late intermediate student, offers a wide range of articulations to perform. 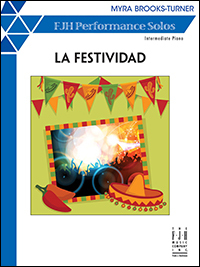 From the four-measure legato melodic lines, to staccatos, tenutos, two-note phrases, and syncopated rhythms, students will have broad exposure to the various pianistic techniques used to communicate the mood of a piece. 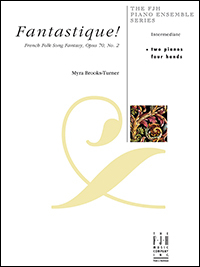 Written for two pianos and four hands, this early advanced duet will prove invigorating for its performers and a delight for the audience to experience. Marked Allegro and composed in 4/4 time, this piece opens in C major, modulates to D flat, and then reverts back to C major. Students will encounter octave playing, sixteenth-note patterns, and parts that are equal in intricacy.